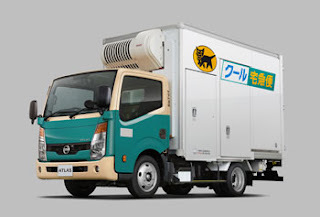 Nissan Motor Co., Ltd. will conduct test drives of the ATLAS F24 Refrigerator Truck by Li-ion Battery for a one-year period starting this month, in cooperation with Yamato Transport Co., Ltd., headquartered in Chuo-ku, Tokyo. This vehicle is the first truck in the world to sustain continued operation of its refrigerator and chiller compartments through a dedicated lithium-ion battery system during small cargo delivery runs. The lithium-ion battery system installed on the vehicle was developed by 4R Energy Corporation. This system places no burden on the car engine, so improvements in fuel efficiency are expected. In addition, the output of the refrigeration equipment is not influenced by the number of revolutions of the car engine. This makes it easy to manage the temperature of the refrigerator and chiller compartments, and contributes to improvements in quality management for the products to be delivered. Even when the engine is switched off during delivery, there is sufficient battery capacity to ensure stable operation of the refrigerator and chiller compartments for long periods. Nissan has customized the specifications of the ATLAS F24 Refrigerator Truck to match the needs of Yamato Transport's services, and will provide this vehicle on loan to Yamato Transport as a monitor vehicle. Yamato Transport will utilize this monitor vehicle for its operations in Kawasaki City, Kanagawa Prefecture, and verify the practicality of the vehicle with Cool TA-Q-BIN and other operations. The standard model of the ATLAS F24 Refrigerator Truck by Li-ion Battery is scheduled to go on sale in Japan in summer 2013. Nissan Corporate Vice President Hideto Murakami, responsible for the Global LCV Business Unit, said, "The ATLAS F24 Refrigerator Truck by Li-ion Battery is the world's first truck that is able to offer continuous operation of its refrigerator and chiller compartments, without using the engine, through a lithium-ion battery power system. "For typical refrigerated vehicles, the refrigeration and chilling functions are suspended once the engine is switched off, such as during delivery runs. However, the ATLAS F24 is able to keep these functions in operation, thereby enabling constant and stable temperature management. "The system runs silently and does not generate emissions, contributing to the reduction of CO2 emissions and lower fuel costs. Through the test drives, we hope to verify the functionality of specifications that have been tailored to the needs of Yamato Transport. We also hope that the standard model, scheduled to be launched this summer, meets the expectations of even more customers." Takashi Ashihara, Yamato Transport's executive officer responsible for business reform, said, "Generally, vehicles park at each destination for pick-up and delivery. However, we are attempting to decrease frequency of parking by transshipping parcels for several destinations from a vehicle to a handcart. We expect this will contribute to prevent traffic accidents and reduce CO2 emissions. On the other side, it might increase the per time of parking time. Our signature service – Cool TA-Q-BIN – has two temperature belt delivery services, frozen and chilled. So, it's essential to maintain stable temperature control even when the vehicle engine is switched off. We anticipate good test results for the Cool TA-Q-BIN in combination with ATLAS F24." As the industry leader in the field of zero-emission vehicles, Nissan is working to develop and sell commercial electric vehicles (EVs), in addition to passenger EVs, such as the Nissan LEAF. Nissan currently is preparing to launch the e-NV200 EV in 2014, a vehicle that is based on the light commercial van, NV200. In order to extend the value of EV technology to the truck sector, Nissan is developing various trucks that make use of Nissan LEAF battery components. Beginning with the ATLAS F24 Refrigerator Truck by Li-ion Battery, the company plans to introduce models such as the 100 percent electric truck, e-NT400 ATLAS, and the ATLAS F24 Power Supply Truck in the near future.